Love veggie bowls? 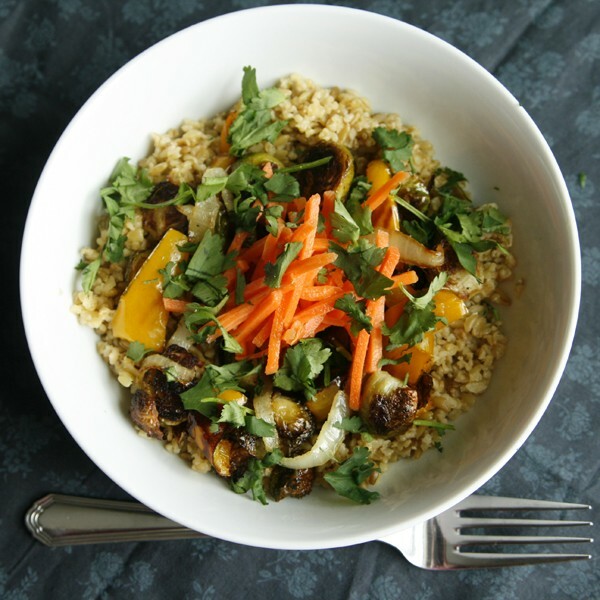 Forget the rice and instead dig into this Warm Vegetable Bowl with Pickled Carrots and Freekeh. When I accepted my job last spring, I knew that our office would be moving soon. Last month, it finally happened. Now situated in the heart of downtown in our fair city, we’re in the center of everything — including the growing food scene, which is pretty awesome. There’s a lot of good food — from the noodle bar serving up delicious custom soups to the vegan juice bar with creative salads to the bakehouse run by friars who make enormous sandwiches. And it’s no secret that I love to grab lunch with my coworkers — it’s a great chance to get out, catch up and take a breather. Ultimately though, the new location is delicious for my belly, but not so much for my wallet. For those of you who already take lunch to work regularly, that might sound a little ridiculous. I mean, how hard is it to prepare ahead of time and just take lunch? But when it’s not part of your routine, it’s a challenge. My mornings are whirlwind. Between getting ready myself, preparing the kids’ lunches supervising the morning routine and getting out the door on time, my own lunch is last on my priority list. And somehow, I can’t seem to get a step ahead. But since I have big life goals and daily eating out doesn’t get me there, I am working on it. Step one: preparing for weekday lunches on the weekend. On weekends, I am often cooking only for myself. In the past, that’s meant either small portions … or weird food combinations (frozen potstickers, kalamata olives and a clementine, anyone?). But when I cook multiple servings of dishes that reheat well, they double as lunch options — which makes taking lunch to work that much easier. 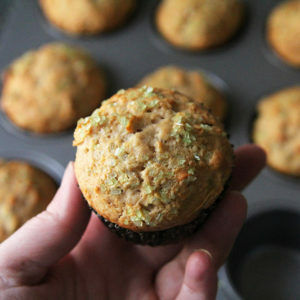 The trick is to pack leftovers for lunches right away so that they become grab and go in the morning. 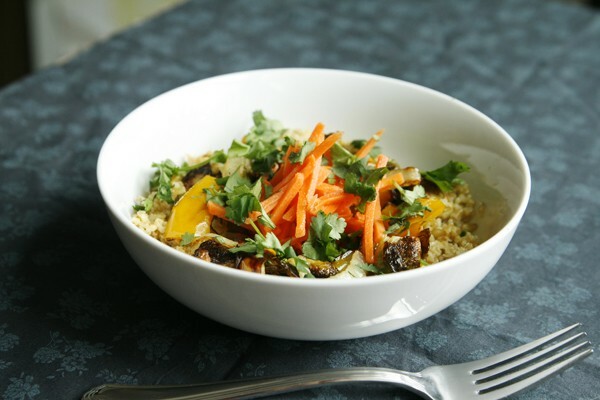 Enter this recipe for Warm Vegetable Bowl with Pickled Carrots and Freekeh. Warm roasted veggies with a hint of natural sweetness sit atop tender, slightly smoky, slightly nutty freekeh. Chilled pickled carrots top it all off, making this dish a symphony of flavors and textures. It can be made in as little as 30 minutes (if you hustle! ), and makes four nutrient-rich servings. Hint: If you are packing extra portions for lunches, keep the pickled carrots separate from the freekeh and roasted veggies. And chop the cilantro the morning you’ll be eating it, and pack that separately too. 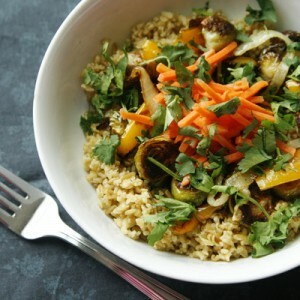 Reheat the veggies with the freekeh and then top, as desired, with the cool carrots and cilantro before eating. I love this dish because it’s both healthy and full of flavor — which means that I look forward to digging in. Always a good thing. But wait. What’s this freekeh? 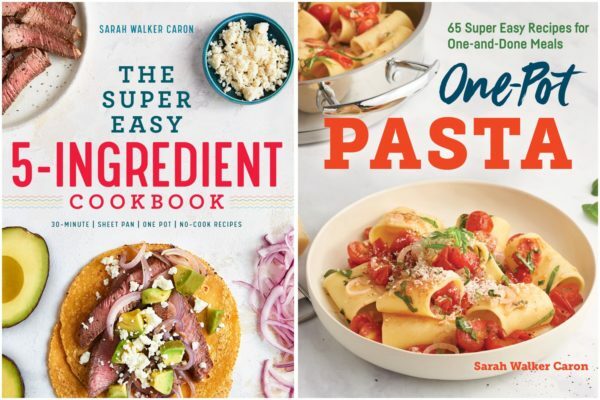 One of my favorite parts of working on my cookbook, Grains as Mains: Modern Recipes Using Ancient Grains, was getting up close and personal with grains I didn’t eat much — if at all — beforehand. From millet to amaranth, barley to freekeh, I discovered a whole world beyond rice and pasta. Freekeh, which is high in fiber, is roasted green wheat, which is why it has that distinctive flavor. It’s a great substitute for rice in dishes like rice bowls, fried rice and even stuffed bell peppers. I love it. I saved two bowls of this dish for lunches this week. My lunch box is ready too, and I know what all of us are packing tomorrow. We’ll see how it goes. Do you take lunch to work? 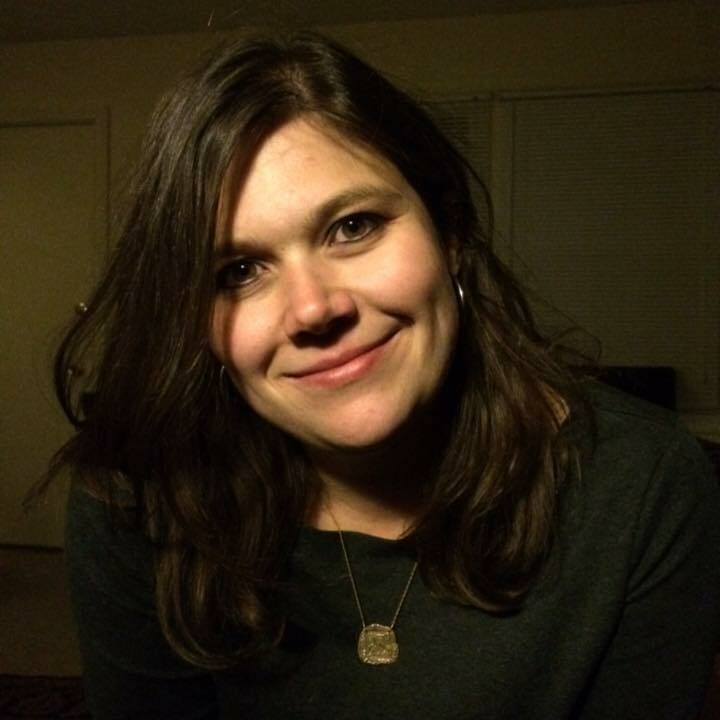 Any tips for this late convert? In a resealable container, combine the carrots, rice vinegar, ground ginger and 1/4 tsp kosher salt. Stir well to combine. Seal and chill for at least 30 minutes. Preheat the oven to 400 degrees Fahrenheit. 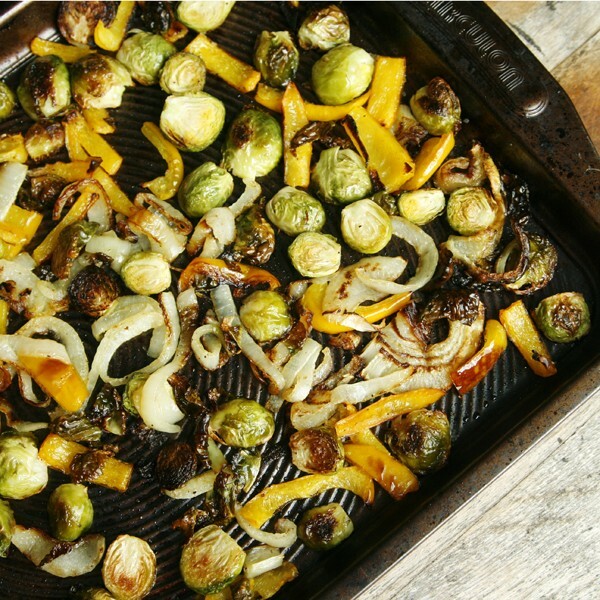 Combine the peppers, onions and Brussels sprouts on a rimmed nonstick baking pan. Drizzle with olive oil and season with salt and pepper. Stir well to combine. Roast the vegetables for 25-30 minutes, stirring once or twice, until golden and tender. To serve, divide the freekeh evenly among four bowls. Top each with 1/4 of the roasted veggies and 1/4 of the pickled carrots. Sprinkle with 1/4 of the cilantro. 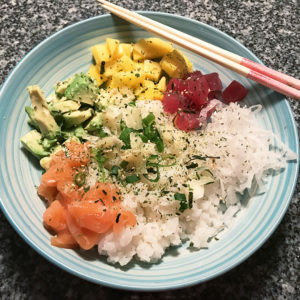 This looks so flavorful! Perfect light lunch! How awesome that your office is surrounded by so many good lunch spots. I’ve been cooking more and more with freekeh and just love the texture. Topping it with roasted veggies is a fantastic idea! Those roasted vegetables look absolutely perfect! I’ve never tried freekeh but it looks delish! I love veggie bowls and this one looks like a keeper! I would gladly eat this for lunch, dinner or even breakfast if it happend to be in the fridge. 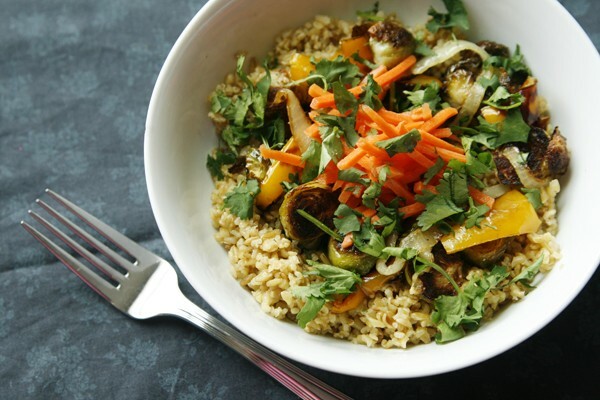 Love the combination of roasted veggies and love the texture of the freekeh. A bakehouse run by friars!? Oh man, that is a place I’d love to eat. This sounds like a delicious take-to-lunch option…healthy and filling. Yes! When I first moved here, I didn’t believe that actual friars ran it, but they do. And it’s one of the best places for lunch in town. Mmm. Ooo! I’ve not heard of freekeh before now. I’ll have to keep my eyes peeled for it. Roasted vegetables atop whole grains sounds like a great lunch. My lunch suggestion is to prep and package as much as you can for the week ahead. 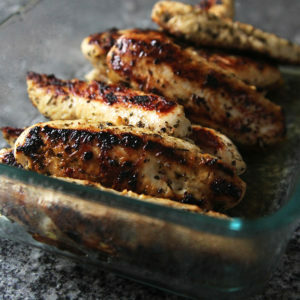 Also plan dinners that you love during the week and then set a lunch portion aside before serving. I’m pretty sure I’m the last person on earth who has not have freekeh. This must change ASAP! Especially when there is pickled carrots involved. Ha! Probably not, but I highly recommend it. And the pickled carrots make it totally awesome. A bakehouse run by friars…what, what?!? How cool is that! And how cool is your freekeh salad. Congrats on your book, Sarah!!! Such a great healthy lunch option! I don’t know if this helps at all, but I make our lunches at night so it doesn’t factor into the hectic morning routine. I’ve never tried freekeh or pickled carrots…both sound delish! Why have I not heard of freekeh before? I too am trying to be better about bringing my lunch to work more often but I’m really bad about forgetting! 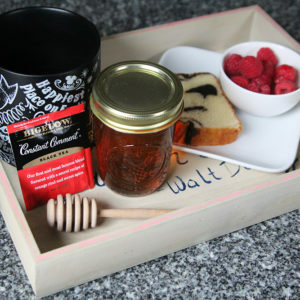 I need to make some of this and package it up for lunch! I have never had Freekeh either! I admit, I’ve been living under a rock but I can’t wait to try this bowl. It’s totally something I would love to pack for lunch! My lunch for work seems to be the last thing done in the morning as well. I try and do it at least half way when making the kids lunches so I’m not so rushed in the am. This would go perfect in my lunch! This is truly fabulous. I love roasted vegetables, even better in a bowl with all kinds of yummies. I think I could eat this every day. I had to translate “freekeh” back to German to understand what it is – the name in English is too funny!! This roasted veggie bowl is absolutely delightful. Just perfect! !